Bungee jumping from 180 m Doplan bridge. Rafting in Armand wild river. 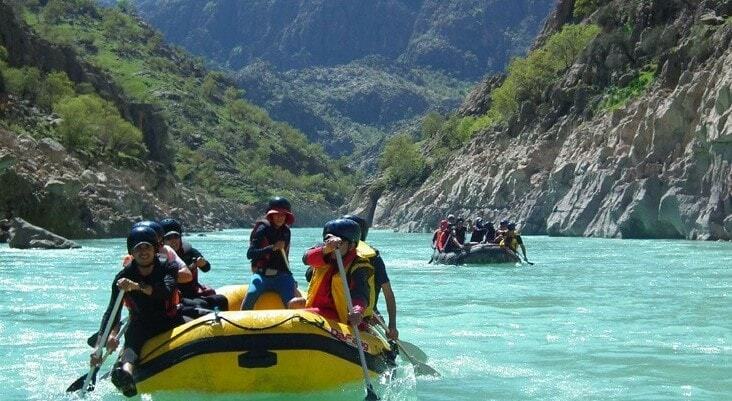 Spend 8 days of adventure in Iran, from rappelling to diving and rafting. If you are into adventure and you like to have a unique Iran adventure tour, we highly recommend you to to join this Iran travel agency especially for rappelling at Reghez canyon as the bride of Iranian canyons and bungee jumping. Shahr-e Kurd is another destination for nature lovers. This tour, offered by Iran Destination, Iran travel agent, also includes diving in Persian Gulf crystal water. Water sports like jet-ski, boating, cable ski and fly board all make an unforgettable adventure for you. Arrival at Imam Khomeini International Airport (IKA), meet your guide and transfer to Shahr-e Kord. We’ll be rafting on wild Armand river for about 5 hours along 28km. Armand river is full of water in March and April especially, therefore it might be the most attractive place for rafting under sunshine, even for jumping. Transfer by off road cars to Chaman Ice Cave for climbing and visiting. This cave is made of Ice from snows over years. After lunch transfer to Doplan bridge for bungee jumping. This is the most attractive part of our Iran adventure tour. you’ll jump from a 150 m height. on the 4th day of this tour, offered by our Iran Tour Operator, Transfer from Shahr-e Kord to Darab after breakfast, in the afternoon half Day rappelling training. Full day rappelling and climbing in Reghez canyon, Reghez is called the bride of canyons in Iran because of its waterfalls, natural pool and other beauties. All the equipment necessary for climbing will be provided. waterproof camera would be the best thing for recording our moments in Reghez. Besides natural attractions, we’ll spend some time in relaxing areas watching birds at Harra forest. Full Day snorkeling and diving in crystal water of Persian Gulf and some water sports. Paragliding and paramotoring are another activities on Qeshm beach. Flight from Qeshm to Tehran for departure.